A man driving a snowmobile on the White Pine Trail was injured last week when he attempted to cross an intersection in front of a pick up truck. According to the Montcalm County Sheriff Department, the crash occurred about 6:17 p.m., Wednesday, January 3, at the intersection of West Howard City-Edmore Road, just west of Federal Road, at the White Pine Trail crossing. 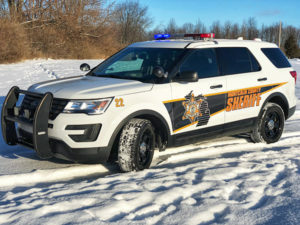 Police said the investigation revealed that a 2015 Arctic Cat snowmobile driven by a 49-year-old Sparta man was traveling south on the White Pine Trail. The Sparta man failed to stop at Howard City-Edmore Road and attempted to cross the roadway in front of an eastbound Chevrolet 2500 pickup driven by a 29-year-old St. Johns man. The pickup truck struck the snowmobile, causing the driver of the snowmobile to be ejected from the machine. Montcalm County Emergency Medical Services transported the man to the hospital with non-life threatening injuries. The driver of the pickup truck was not injured. There were no other contributing factors to the crash and the snowmobile driver was wearing a helmet. The crash is still under investigation. Assisting on scene were the Michigan State Police, Montcalm County EMS, Rescue 29 and the Howard City Fire Department. For snowmobile safety tips, click here.